Fake Wizard or Awesome God? The Book of Job in the Hebrew Bible wrestles with the question of ‘Why do righteous people suffer?’ Also, reading Job, we find ourselves wrestling with the mysterious ways and hidden purposes of God, and also, with how we might respond existentially to our own searing suffering or the suffering of others. G.K. Chesterton again: “The Iliad is only great because all life is a battle, the Odyssey because all life is a journey, the Book of Job because all life is a riddle.” (The Defendant) I propose to make a bit of progress in unraveling the riddle of lived life before a majestic, mysterious God in a world that has just the odd features that it has. I will do this by rehearsing part of the story of Job, and then, comparing and contrasting Job and his God with my interpretation of the familiar story of The Wizard of Oz. Job lived in an unattested place called ‘Luz’. He “…was blameless and upright, one who feared God and turned away from evil.” (Job 1:1b & c, ESV) He had seven sons and three daughters (vs. 2). Job was very wealthy. He possessed: 7,000 sheep, 3,000 camels, 500 yoke of oxen, 500 female donkeys and lots of servants (vs. 3). Job’s children were a central project for him. The children would often hold feasts together. When the feasts had run their course, Job would offer burnt offerings for each of them, thinking, “It may be that my children have sinned, and cursed God in their hearts.” (vs. 5c, ESV) Don’t you feel a ‘but’ coming? The scene shifts to God’s throne. “Now there was a day when the sons of God came to present themselves before the LORD and [the] Satan (or the Accuser/the Adversary, see ESV margin. The def. article may be applied every time ‘Satan’ appears. Thus he would be like a prosecuting attorney.) also came among them. The LORD said to Satan, ‘From where have you come?’ Satan answered the LORD and said, ‘From going to and fro on the earth, and from walking up and down on it.’ And the LORD said to Satan, ‘Have you considered my servant Job, that there is none like him on the earth, a blameless and upright man, who fears God and turns away from evil?’ Then Satan answered the LORD and said, ‘Does Job fear God for no reason? Have you not put a hedge around him and his house and all that he has, on every side? You have blessed the work of his hands, and his possessions have increased in the land. But stretch out your hand and touch all that he has, and he will curse you to your face.’ And the LORD said to Satan, “Behold, all that he has is in your hand. Only against him do not stretch out your hand.’ So Satan went from the presence of the LORD.” (Job 1:6-12, ESV) All of Job’s possessions and his ten children are taken from him. A second divine court scene begins in chapter 2, with the same form as the first, except that God notes that Job has maintained his integrity and Satan is allowed to take Job’s health but not his life. The theme in a recent post about seeking God’s face and not just his hand, what he does for us, is explicitly inquired about: Will Job/people fear/love/serve God for no reason, for nothing? Job passes the first test (losing family and possessions) but whether he passes the second test is ambiguous, depending on where in the book one reads. Look at Job’s initial response to disaster. Truly at this point Job will fear/serve God for nothing, for no thing. “Then Job arose and tore his robe and shaved his head and fell on the ground and worshiped. And he said, ‘Naked I came from my mother’s womb, and naked shall I return. The LORD gave, and the LORD has taken away; blessed be the name of the LORD.’ In all this Job did not sin or charge God with wrong.” (Job 1:20-22, ESV) I used to perform a song by Honeytree. The lyrics are these words of Job. Three friends of Job show up to comfort and sympathize with him (near the end, a fourth, Elihu arrives). They can’t recognize Job from a distance. They throw dust up in the air, rip their clothes and sit silently with Job for seven days and nights. Sometimes, in the presence of great suffering or grief, just quiet presence is best. Rushing in to impose explanations is often not welcome. Sometimes, like the three friends (we’ll see), we speak to impose answers to selfishly deal with our own discomfort, confusion and doubts. Cursing and cussin’ was an art form in the Ancient Near East. Job is, perhaps, saying that he would give up all the good he has experienced in his life if that would also mean that he need not experience the recent disasters. I have felt this way before and I have heard others express similar feelings. But it’s amazing what a little good health will do to change one’s mind! What do you suppose will happen when Job or you talk this way? You’re right of course! Friends and family will say that one ‘can’t’ talk that way. And if one casts doubt on the justice or goodness of God, then people will labor to provide explanations for the suffering, partly to comfort their own souls. Most of the Book of Job (chapters 3 – 37) chronicles the arguments, back and forth, between Job and his friends. There is a strong thread that runs through much of the Bible. If one keeps the covenant with God, does good and keeps the Law, one will be blessed in life on earth with possessions, health, protection, happiness, etc. On the other hand, if one breaks the covenant, does evil, breaks the law and sins against God and humankind, one will be cursed in life on earth with poverty, disease, war, misery, etc. This is a simplistic summary of this thread, but there is a tendency. This thread is sometimes called the Deuteronomist because of the association with the Book of Deuteronomy in the Hebrew Bible. Deuteronomy tells of how Moses led Israel to renew their covenant with Yahweh just before they entered the land which Yahweh promised them. They shouted the vivid blessings from one mountain and the blood-curdling curses from another mountain. But some Israelites, especially in Wisdom literature, noticed that life didn’t always work out as neatly as the Deuteronomist indicated. Even if the Majority Report, so to speak, proclaimed that 99.9% of the time the LORD blessed the righteous and punished the wicked, writings like Job, Ecclesiastes, and some of the Psalms, noted that that is not always the case. Even Jesus taught that the Father sends rain and sun on the righteous and unrighteous, that a man was born blind not because of his sin or his parents’ sin, but that the glory of God might be seen in him (Jesus healed him), and that the men on whom the Tower of Siloam fell were not particularly wicked. The speeches that Job’s friends launched at him were mostly from a Deuteronomist viewpoint. Job has some secret sin. Job is sinful for saying he hasn’t sinned; he is self-righteous. Job questions the wisdom of the Almighty. God is good, just, etc. And so on, chapter after chapter. Some of their speeches about God sound so true and orthodox! Some of them are true, just incomplete or given in the wrong spirit or given at the wrong time in the hearer’s life. From what I know of life with God, I must say: watch out what you ask for! Those who know the story, know that God does show up. But we must look briefly at why I place The Wizard of Oz along side The Book of Job. Then we will tease out two views of God’s response to Job. I hope that after all this, we will be able to see a simple point that we will, nonetheless, have occasion to use in future posts. Consider some surface connections between Oz and Job. Dorothy is taken to the land of Oz; Job lives in the land of Uz. Dorothy is conveyed to Oz by a tornado; God shows up to question Job in a tornado. The Wizard lives in The Emerald City; “..around the throne [of God in his heavenly throne room] was a rainbow that had the appearance of an emerald.” (Rev. 4:3b, ESV) When Dorothy and friends arrive in the Wizard’s throne room there is a frightening display; “From the throne [of God] came flashes of lightening, and rumblings and peals of thunder…” (Rev. 4:5a & b, ESV) Maybe there is a parallel between ‘the yellow brick road’ and heaven’s streets that are ‘paved with gold’. L. Frank Baum, author of The Wizard of Oz and many sequels, was a skeptic toward God and had a quarrel with him. It seems to me that The Wizard of Oz is Baum’s commentary on Job. Taken that way, God does not have the power to rescue, and when he appears before Job he just frightens him silly and does not give an answer with content. In the Wizard, Dorothy, the cowardly Lion, the Tin Man and the Scarecrow finally discover that the Wizard can not save them and that all good that they find is inside them or already around them. The Lion has courage when he believes he has courage; the Tin Man has a heart when he believes he has it; ditto for the Scarecrow and his brain; Dorothy can go home when she simply clicks the ruby shoes together and says “There’s no place like home.” BTW, I was going to dis Toto as foo-foo compared to the tough and clever Jack, the BSD. However on further reflection, I have to give Toto props for not focusing on the illusion, but seeing things as they are and exposing the fraudulent Wizard. 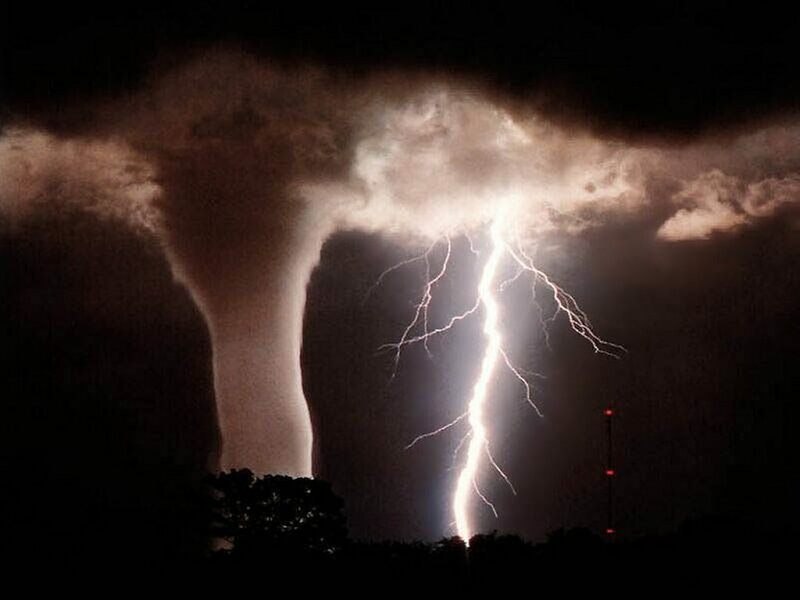 I am fascinated that God appeared to Job in the tornado/whirlwind. It was not a dust devil like we have here in the Mojave Desert. It was something dangerous as befits a dangerous God. Somewhere G.K. Chesterton wrote something like, that those who worship a God of tornados, must at least some times, root for the tornado. There is something invigorating about that. Of course, I do want people to be injured, die or lose property. And of course, God also comes to us in a still small voice and other gentle ways. And yet… If we are to survive the overwhelmings of the world, we must be overwhelmed and saturated by the Presence, the Holy Spirit, the living water, the abundant life, the love and the burning heart of God. If we try to tame or domesticate God, we become bored, apathetic, listless and courage and heart leaks out of us. For more on the theme of overwhelming, which I frequently use, check out: The Shape of Living: Spiritual Directions for Everyday Life by David F. Ford (Baker Books, 1997). Two writings by G.K. Chesterton that are somewhat like my thinking about living with questions and suffering are: “Introduction to the Book of Job” http://www.cse.dmu.ac.uk/~mward/gkc/books/job.html and “The Man Who Was Thursday: A Nightmare” This essay and book are available cheap on Amazon for Kindle. We are coming to the end of my longest post so far. My parents are from Oklahoma, which is tornado country . My wife, Terry, is from Kansas, which is really tornado country. I have been too close for comfort to several tornados, but probably never in great danger. One summer, we visited Terry’s family in Kansas. I saw a lot of t-shirts on people and at the mall that combined the themes of Kansas, tornados and the Wizard of Oz. I still remember two of them. One said, “Dear Auntie Em – Hate you, Hate Kansas, Took the dog – Dorothy. The other one said, “Dear Dorothy – Hate you, Hate Oz, Took the Shoes – Toto” Hey, that’s Kansas humor for you. Did I tell you that some of the good ol’ boys in Terry’s family like to chase twisters? Well, they do. It’s been hot here, over 100 F. Jack Lewis is a smart dog: he avoids going out in the heat, and when he does, he stays in the shade. A few days ago I was reading one of my daily devotional books, this one from C.S. Lewis. The subject was forgiving. Lewis wrote that, rather than start with forgiveness of major villains, we start with the people around us: family, neighbors, co-workers, etc. This seemed like something I should do. Meanwhile, while I read and napped for several hours, I assumed that Jack was in the spare room. When Terry came home, Jack ran in with her. Caesar Milan, the Dog Whisperer, says that dogs live in the present moment and do not tell themselves stories about the past. They respond to energy that comes from humans now. So, Jack came in and jumped in my chair with me, as though I had done nothing wrong. I don’t say that Jack forgave me, but that he didn’t hold a grudge. There is something to be learned from that. Oh yeah, the end of the story. God said Job was right and his friends were wrong, and if they wanted to be forgiven, they must ask Job to make sin offerings for them. Job was given back his good health and became much wealthier than he had been before. He was given some incredibly beautiful daughters. But I fear he was stuck with his old wife. If you want to dialogue with me about meanings of The Wizard of Oz or about whether Job was an historical figure, let me know and we can do that outside of this web site. Today’s post was powered by: “10,000 Charms” (2002) by the Robbie Seay Band and by “Live Under the Red Moon” (2006) by the Call. Tags: awesome God, C.S. Lewis, G.K. Chesterton, Jack Lewis, Job The Wizard of Oz, L. Frank Baum, problem of good, problrm of evil, Robbie Seay Band, The Call | Permalink.